Do you have a set of keys that are slowly losing their efficiency? Are you concerned that your rusty old key might get jammed inside the lock or break into two leaving you stranded? 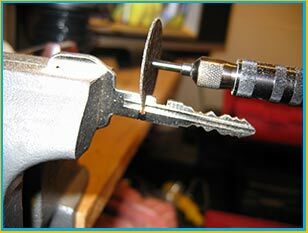 Quash all your worries and avail our key cutting services today! Need a key for your abloy locks, padlocks, or mul-T-locks? Our locksmith experts can cut a variety of keys with state-of-the-art equipment and ensure that each key is designed to suit your every need. Plus, with us, you have the benefit of availing our services at your location! Say goodbye to traveling all the way to a hardware store or a locksmith just to get your keys cut, our mobile locksmith vans offer doorstep service to clients and have the manpower to serve anywhere in Boulder or its vicinity. Most people who avail services from local hardware stores end up regretting their decision as the product is of inferior quality and poor build. Hardware stores offer key cutting for residential purposes at a cheap price and use low-quality material in order to make a profit. We, on the other hand, offer affordable key making services and ensure that the finished product is properly calibrated for your locks and have well-shaped edges. Clients can avail our 24x7 emergency services any day of the year. Our outstanding team of locksmiths is available throughout the night and can be easily approached on our helpline. If you have lost or damaged your keys and need a new one immediately, call us and state your urgency and our team will be there within 15-20 minutes! We know exactly what goes into providing a seamless key cutting service and that is why we have been a trusted brand for over 10 years. We take every effort to ensure that your workload is minimized and you get the most economical service from highly-skilled technicians. Boulder Lock And Key offers qualitykey cutting for residential and other purposes. Do you wish to engage a locksmith? Reach out to us on 303-357-8331 !